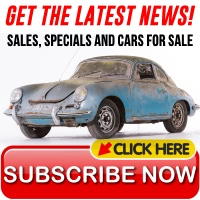 Stoddard Porsche Parts stocks thousands of parts to restore and maintain your Porsche 356. Our efforts to help keep 356s on the road started in the 1970s with our rust repair panels, like floor pans and new rocker panels. NLA-541-101-06-SET Clear Glass Set, For 356B T6 and 356C Coupe. All Side, Back and Windshield Glass with Small, Correct Logos. NLA-541-101-01-SET Clear Glass Set, For 356A T2 and 356B T5 Coupe. All Side, Back and Windshield Glass with Small, Correct Logos. NLA-541-101-00-SET Clear Glass Set, For 356A T1 Coupe without Vent Window. All Side, Back and Windshield Glass with Small, Correct Logos. NLA-541-101-11-SET Tinted Glass Set, For 356B T6 and 356C Coupe. All Side, Back and Windshield Glass with Small, Correct Logos. NLA-541-101-10-SET Tinted Glass Set, For 356A and 356B T5 Coupe. All Side, Back and Windshield Glass with Small, Correct Logos. PCG-547-721-10 Porsche Classic Tool Bag and Kit (16 pieces); suitable for all Porsche 356 Carrera (1955 to 1965). NLA-695-KIT Stoddard Exclusive Wheel Cylinders, Complete Set of 6 for 356 356A and 356B. NLA-111-010-05-SS Stoddard Stainless Steel Sport Exhaust System for 356. Exits Through Bumper Guards. 912 Tips Available. NLA-111-006-00-SS Stainless Sport Tail Pipes for Stoddard Exhaust System, Exiting Below Bumper. Fits 356. NLA-BRAKE-KIT Full Drum Brake Kit (Front and Rear) for 356 356A and 356B. Includes All New Wheel Cylinders, Shoes and Hardware. SIC-600-356-3 Stoddard Porsche 356 Parts And Technical Reference Catalog.